Designs By H J Nick ArtFactory.com and some of the worlds top designers, builders and Architects are all Handmade in our manufacturing plant based in Scottsdale Arizona with distribution world wide. We have been designing and building some of the worlds finest custom wrought Iron Gates for some of the world’s ordinary clients as well as most prominent and successful Persons,C.E.O.’s,leaders,royalty and celebrities for the past 97 years. Most of our clients want a entrance that has a BIG WOW factor as well as elegance. All want investment value that makes a proper statement reflecting their personality or the personality of the environment for which it is intended. Investment Quality Equals An Appreciable Asset Furnishing, Destined For Antiquity. 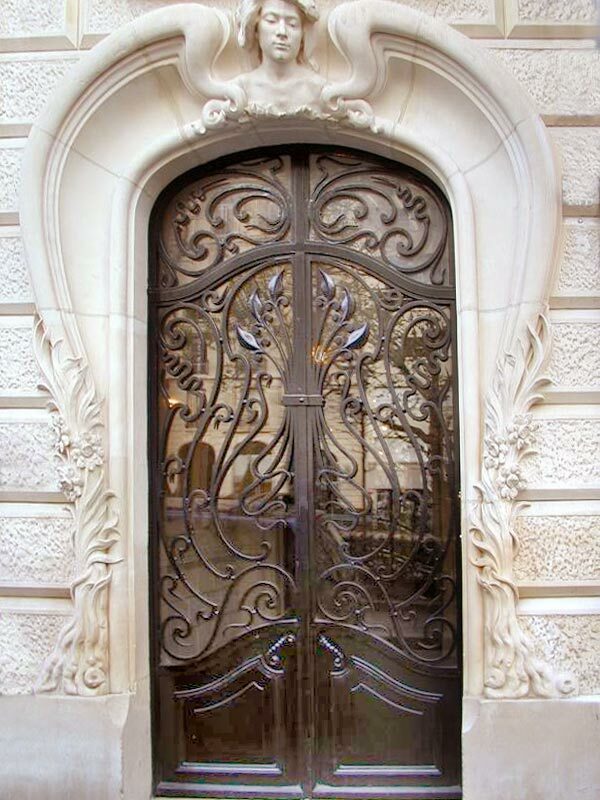 Important Facts You Need To Understand About Wrought Iron this information will inform you and allow you to choose iron gates that will appreciate in value and stand the test of time. Don’t Be Fooled By Our Upscale Appearance. Our prices are usually lower than lesser quality name brand mass production imports, “We Are The Factory,” Hand Crafted In America Since 1913. This Is Not A Foreign Made Mass Produced “Famous Brand Name” Fake Import Impostor. Our Factory Designers Are Expert At Manufacturing Our Products And Are Not Salesman. Purchase American Made – Invest In “Your” Future. Most Designs Used Today Were Conceived Hundreds Of Years Ago By Some Of The Worlds Most Famous Architects And Designers Working For The Aristocracies And The Well To Do Of Their Period. Many of these architects and designers are as well known as Leonardo da Vinci (renaissance architecture) or Michelangelo,s (baroque architecture) as well as more recently William Morris, John Ruskin (founders of the Arts and Crafts furniture movement in circa 1800 England) Gustave Stickley (founder of the American Arts and Crafts movement in America circa 1900.) Frank Loyd Wright, Charles and Henry Greene to name a few. Every Successful Creative Enterprise Is Always Built On A Foundation That Was Laid Down By Its Predecessors. All creative people are dependent upon the groundwork laid down by those who came before them. H. J. Nick, artist and direct descendant of the Marbella brothers, and ArtFactory.com have built on these foundations and have raised the bar of quality even higher. Thus setting a new standard and offering the finest one of a kind handmade furnishings found anywhere in the world in the 21st century. Today Our Master Craftsman Build All Of Our Products Using The Identical Methods And Materials Of The Historical Period Of Each Furnishings Design Conception. All 21st Century Designs Are Also Built By Our Master Craftsman Using These Classic Traditional Methods. every element Is always built to future collectable antiquity investment quality standards and will stand the test of time. Destined to become a part of your families appreciating financial net worth as well as a proud to own legacy heirloom. We Are A “One Stop Shop”. Many of our clients commission furniture For every room, doors, gates, built-in cabinets, lighting and hardware for their entire project. For Example: We are capable of starting with your entrance door design style or personalized carving coat of arms, family crest or business logo and bring this design in a tastefully elegant way in to you interior and exterior lighting fixtures, entrance doors, Interior doors, cabinets, structural elements, entrance gates or furnishings for every room. Making your home a unique piece of your families tradition and legacy. Many of the worlds finest builders, architects, interior designers, as well business and home owners choose ArtFactory.com. Due to our large flexible American work force and our ability to manufacture coinciding with construction deadlines. Note: We do not import or out source allowing us total control of our supreme quality as well as your production requirements. You May Order: The Gate Blade Only – A Complete Entry Unit – Straight Top – Eyebrow Arch Top – Full Arch Top – Single Door – Double Gates – Any Size And Style. In This Section On Each Product Page Located Under The Appropriate Pop Down Menu – We Provide Detailed Product Information As Each Photo Is Shown. Each Item Is Shown As The Customer It Was Built For Required Its Specifications. However Each Item Can Be Changed To Any Size Or Redesigned With No Design Charge. We “Only” Provide Accurate Facts About Each Product We Build. We Also Instruct Our Designers To Provide You Factual Comparison Product Information When Possible With Out Bias Or Hype. Due to the vast array of Name Brand American Manufacturers that have in recent years sold out the public for higher profits with out regard for quality. Beginning with the use of cheap foreign labor manufacturing along with low quality fake materials such as hollow steel in place of solid wrought iron. Powder coating and painting in place of advanced patinias that virtually maintenance free and will stand the test of time. Duplicating – coping the worlds famous quality designs without good conscience or regard for your future use requirements Not To Mention The Loss Of Your Hard Earned Investment. Fact : These Types Of Products Will Never Become Heirlooms Or An Appreciable Assets . All Iron Is Coal Fired, Hammered By Master Blacksmiths The Old Fashioned Way And Patina Finished. At ArtFactory.com, we take pride in our traditional, superior quality workmanship and craft our products from only the finest iron. Our master blacksmiths have been classically trained, and utilize old world techniques such as coal firing, anvil hammering and hand forging to create the finest handcrafted hardware available anywhere. All of our iron work is hand patina finished by heat applying iron oxides to achieve a natural patina finish that will stand the test of time. Nothing is Drop Forged. We create works The Old Fashioned Way using solid hand forged iron, (drop forging is a poor quality, casted copy of a hand forged work of art). Master Blacksmithing: The kind of hand forged metal work you can expect when you order from ArtFactory.com. Patina Finish As Shown: Various Colors Of Hand Applied Iron Oxide Patinas. All steel parts are hand patina finished the old fashioned way by iron oxide hand applied with high temperature heat. We never powder coat or faux paint our steel, it has been our experience that paint and powder coating methods do not hold up over time. You may choose from many natural iron oxide colors, and all our patina finishes are water based and earth friendly. You may order any single color or texture finish at no extra charge. Every surface of this hardware is finely finished including the under sides and hidden areas. Each item is finished to be virtually maintenance free and to age with grace to stand the test of time. Fine Finish Information: Important details about patina finishes. All SAF Door & Gate Engineering Exceeds Commercial & Hurricane Requirements. Our Guarantee: We Guarantee Each Item “Forever” ” No Questions Asked, backed by over nine decades of fine craftsmanship. Our Price Guarantee: Why you may purchase hand made custom at production prices. ArtFactory.com carries on the American Arts And Crafts Movement of the 21st century, in the same way William Morris and John Ruskin (founders of the Arts and Crafts furniture movement in circa 1800 England) inspired Gustave Stickley (founder of the American Arts and Crafts movement) in America circa 1900. Frank Loyd Wright, Charles and Henry Greene (inspired architects of the ultimate cottages such as the Gamble House in Pasadena California) are credited with raising quality standard to its highest level in their day. All of these great master craftsman also inspired the Marbella Brothers in the early 20th Century (founders of SAF circa 1913). Every creative enterprise is always built on a foundation that was laid down by its predecessors. Creative people are also dependent on the groundwork laid down by those who came before them. H. J. Nick, artist and direct descendant of the Marbella brothers, and ArtFactory.com have built on these foundations and have raised the bar of quality even higher. Thus setting a new standard and offering the finest one of a kind handmade furnishings found anywhere in the world in the 21st century. Our Heritage: Marbella brothers come to America. See Our Blog More about the history of ArtFactory.com and the American furniture movement of the 21st century.